Disclosed is a balloon of an intragastric device, comprising, in combination: a core of a first material and having an inner surface and an outer surface; and a coating of a second material on at least one of the inner surface of the core and the outer surface of the core. Disclosed is a method, comprising, in combination: creating a core of a balloon by a core in a first material; dipping at least one of an inner surface of the core and an outer surface of the core in a second material, whereby a coating is formed on at least one of the inner surface of the core and the outer surface of the core. 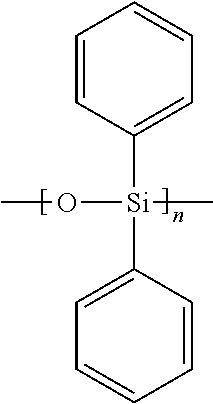 The first material may be of a more dimensional consistency than the second material, have a greater elasticity than the second material, or be primarily of polydimethyl-siloxane. The present application claims priority under 35 U.S.C. 371 of International Application Ser. No. PCT/US2011/024082, filed Feb. 8, 2011, which claims the benefit of U.S. Provisional Patent Application Ser. No. 61/302,465, filed Feb. 8, 2010, the entire contents of which is incorporated herein by reference in their entireties. This application incorporates by reference: U.S. Pat. Pub. No. 2007/0100367, published May 3, 2007; U.S. Pat. Pub. No. 2007/0100368, published May 3, 2007; U.S. Pat. Pub. No. 2007/0100369, published May 3, 2007; U.S. Pat. Pub. No. 2007/0149994, published Jun. 28, 2007; U.S. Pat. Pub. No. 2008/0243071, published Oct. 2, 2008; U.S. Pat. Pub. No. 2008/0319471, published Dec. 25, 2008; U.S. Pat. Pub. No. 2005/0159769, published Jul. 21, 2005; U.S. Pat. Pub. No. 2009/0048624, published Feb. 19, 2009; WIPO Pub. No. WO 2007/053556, published Oct. 5, 2007; WIPO Pub. No. WO 2007/053707, published Oct. 5, 2007; WIPO Pub. No. WO 2007/053706, published Oct. 5, 2007; and WIPO Pub. No. WO 2007/075810, published May 7, 2007; each as if fully set forth herein in its entirety. This disclosure relates to implantable, expandable gastric devices. In particular, this disclosure relates to improved structures of balloons and methods of producing the same. Many conventional implantable gastric devices have a balloon filled with a biocompatible fluid. Such gastric devices are generally inserted into the stomach when the balloon is deflated and then inflated in vivo. The gastric devices are often left in the stomach for an extended period of time to treat severe obesity or other conditions. The gastric devices are eventually removed after completing the treatment or for other reasons by deflating the balloon, grasping the gastric device with an extraction tool, and extracting the gastric device via the esophagus and mouth. Conventional gastric devices are deflated by attempting to puncture the balloon and aspirate the biocompatible fluid through a needle. One challenge of conventional devices is that the balloon are generally fairly large in a deflated state because of the limited elasticity and expansion of the materials that can withstand the harsh environment within the stomach rupture. Many existing balloons for intragastric devices are made from polydiphenylsiloxane (PDPS), which resists degradation by acids, fungal growth and other microbial growth, but it has limited expansion. As such, the cuffs of such a balloon must have a fairly large diameter so that the balloon can be removed from a mandrel during the manufacturing process. Another challenge of conventional intragastric devices is the life span of the balloon. For example, fungi or other microbes can grow into the material of the balloon and effectively decrease the wall thickness. This can weaken the balloon wall to the point that it ruptures under the pressure of the fluid in the balloon. FIG. 7 shows a sectional view of a balloon with a magnified view. Specific details of several embodiments of the present technology are described below with reference to an intragastric device with compound balloon. Although many of the embodiments are described below with respect to a dual balloon intragastric device, other types of devices with only one balloon or more than two balloons may be within the scope of the technology. Moreover, several other embodiments of the technology can have different configurations, components, or procedures than those described in this section. A person of ordinary skill in the art, therefore, will accordingly understand that the technology may have other embodiments with additional elements, or the technology may have other embodiments without several of the features shown and described below with reference to FIGS. 1-7. Several embodiments of the technology are directed to a balloon of an intragastric device comprising, in combination, a substrate or core of a first material that has having an inner surface and an outer surface, and a coating of a second material on at least one of the inner or outer surfaces. The substrate, for example, can be more elastic and/or have more expansion than the coating, and the coating can be more resistant to fungal or other microbial growth than the substrate. Additional embodiments of the technology are directed to a method comprising, in combination, forming a core or substrate of a first material into a balloon and covering at least one of an inner surface and/or outer surface of the substrate with a second material. The second material can be a coating that is sprayed, painted or applied by dipping the substrate into the second material, to form a smoother surface finish, as compared to a surface finish of a molded core, having a roughness from about 0.1 to 0.7 micron. This further inhibits or otherwise impedes the formation of biofilm (e.g., candida) on the coated surface of the balloon. Also disclosed are products by processed disclosed herein. The first material may be of a more dimensionally stable or consistant than the second material and/or have a greater elasticity than the second material. 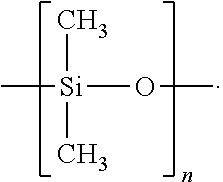 In one embodiment, the first material comprises polydimethylsiloxane (PDMS). The second material may have a higher resistance to acid, be more resistant to fungal or other microbial activity, and be less permeable than the first material. In one embodiment, the second material comprises PDPS. In the specific embodiment shown in FIG. 1, a balloon 30 can be one of several expandable, space filling components. In several embodiments, and as shown in FIG. 2, the balloon 30 may be a component of an intragastric device 10. For example, as further shown in FIG. 2, the intragastric device 10 can have a shaft 20 and a plurality of the balloons 30 may be joined or otherwise carried by the shaft 20. The balloon 30 may have many different geometries and shapes according to the specific anatomy in which the balloon 30 is implanted. As shown in FIGS. 1 and 3, the balloon 30 may have at least one cuff 40 for interfacing with the shaft 20 (FIG. 2) such that the shaft 20 extends through the balloon 30. The balloon 30 may be an open or closed balloon, and the balloon 30 may have an inner surface and outer surface. According to several embodiments of the technology, the intragastric device 10 may be configured for use as an implantable device within a gastric cavity. In many applications, the intragastric device 10 is implanted for several months in the stomach or other gastric cavity having high concentrations of acids and microbes that can deteriorate the balloon 30. The durability and longevity of the intragastric device 10 is accordingly defined, at least in part, by the ability of the balloon 30 to resist the harsh environment within the stomach. As such, the materials and manufacturing methods of the materials are key contributors as to balloon integrity and longevity. According to several embodiments of the technology, at least one of PDMS and PDPS may form the substrate or core of at least a portion of the balloon 30. Other materials, structures, or compounds may be mixed or cross-linked with the based material. According to several embodiments of the technology, a plasma etching or coating may be provided to at least a portion of the balloon 30. Plasma etching may involve a high-speed stream of glow discharge (plasma) of an appropriate gas mixture being shot (in pulses) at a sample. The plasma source can be either charged (ions) or neutral (atoms and radicals). During the process, the plasma will generate volatile etch products at room temperature from the chemical reactions between the elements of the material etched and the reactive species generated by the plasma. The atoms of the shot element embed themselves at or just below the surface of the target, thus modifying the physical properties of the balloon 30. Etching may facilitate better adherence between layers of the balloon 30. According to several embodiments of the technology, various coatings (e.g., hydrophilic) may be applied to at least a portion of substrate or core of the balloon 30. For example, a hydrophilic coating may be provided where two surfaces of the balloon 30 resist flow of fluid there through. In various applications and based on different aspects, each of PDMS and PDPS may be seen as providing certain advantages and disadvantages. According to several embodiments of the technology, the dimensional stability or consistency and elasticity of PDMS materials and PDMS blends enable the balloon 30 to be formed using molding and extrusion processes instead of a dipping process. In particular, molding processes include molding the PDMS material over a mandrel, and the higher elasticities of PDMS materials compared to PDPS materials reduce the stresses involved in removing the mandrel. For example, the balloon 30 may be formed using a mandrel that has a larger diameter at a central portion than at one or both ends (corresponding to cuffs 40). For example, the diameter at the middle of a mandrel may be up to 600% larger than at the end of the mandrel. The balloon 30 must sufficiently elastic to remove the mandrel through the cuff 40 without damaging the cuff 40. According to several embodiments of the technology, the expansion ratio of the balloon 30 from an uninflated state (i.e., before and during implant) to an inflated state (i.e, after implant) may be significant. For example, the balloon 30 may have an outer diameter of about 1.9″ in an uninflated state and about 4″ in an inflated state (over 200% expansion). By further example, the balloon 30 may have a volume of about 80 cc in an uninflated state and about 450 cc in an inflated state (over 500% expansion). These factors are well-served by PDMS materials and PDMS blends. As such, PDMS and PDMS blends are well suited for the substrate or core of the balloon 30. In accordance with several embodiments of the invention, the higher acid resistance and less permeability of PDPS materials and PDPS blends, compared to PDMS based materials, better limit the ingress or egress of materials across the walls of the balloon 30 and support longevity of the balloon 30. Generally, PDPS, as compared to PDMS, is less able to provide consistent wall thicknesses and is less capable of generating molding friendly features, but more capable of resisting acids and growth of fungi or bacteria. In several specific embodiments of the technology, the balloon 30 has a multiple-material composition in which a plurality of disparate materials and material blends may be provide in layers forming walls of the balloon 30. For example, a wall of the balloon 30 may have a substrate or core with at least one coating on an inner or outer surface thereof. FIGS. 5 and 6 illustrate specific embodiments of the technology. In the embodiment shown in FIG. 5, the balloon can have a substrate or core 50 and outer coating 60 a over an outer surface of the core 50. The outer coating 60 a may be provided, for example, by a dipping process after core 50 is formed. In the embodiment shown in FIG. 6, the balloon 30 can have in inner coating 60 b over an inner surface of the core 50. The inner coating 60 b may be provided, for example, by a dipping process after core 50 is formed and the balloon inverted inside-out. FIG. 7 illustrates another embodiment in which the balloon has the substrate or core 50, the outer coating 60 a over the outer surface of the core, and an inner coating 60 b over the inner surface of the core 50. The outer coating 60 a and inner coating 60 b may be provided, for example, by a dipping process after core 50 is formed. In selected embodiments, the substrate or core 50 can comprise PDMS or another material that is moldable and has a higher elasticity than PDPS. The inner and/or outer coatings 60 a-b can comprises PDPS or another material that is less permeable and more acid resistant than PDMS. According to several embodiments, the balloon 30 having a layered, multiple-material composition may benefit from the advantaged of each material while mitigating or minimizing the detriments of each. The present technology is also directed to methods of making the balloon 30 is disclosed. In one embodiment, the substrate or core 50 may be molded of the first material, such as a liquid silicone rubber (LSR) grade material (e.g., such as PDMS). Those skilled in the art will recognize various molding and extrusion processes that may facilitate formation of core 50. The molding process can include injecting PDMS or a PDMS blend into a mold such that the molded material surrounds a mandrel or other form. After curing, the core 50 is removed from the mold, mandrel, or other device, and then the second material may be coated onto the inner and/or outer surface of the core 50. For example, the core 50 may be dipped in the second material to form at least one of the outer coating 60 a and/or the inner coating 60 b. Other embodiments of the method, the core 50 may be coated using other techniques, such as spraying, painting, coating, washing, etc. The second material can be PDPS or another suitable low-permeable, acid and fungal resistant material. The core 50 may compose a substantial portion of the total sum of the balloon 30 or at least the walls thereof. For example, the thickness of core 50 may be about 0.001 inch to about 1.0 inch. By further example, the thickness of core 50 may be about 0.024 inch to about 0.030 inch. The core 50 can have other thicknesses based on the needs and applications of the desired product. The outer coating 60 a or the inner coating 60 b may be a thin relative to the thickness of core 50. For example, the outer coating 60 a or the inner coating 60 b may have a thickness of about 1% to about 99% of the thickness of core 50. By further example, the outer coating 60 a or the inner coating 60 b may have a thickness of about 10% to about 20% of the thickness of core 50. The inner and outer coating 60 a-b can have other thicknesses based on the needs and applications of the desired product. It should be noted that outer coating 60 a or inner coating 60 b comprising PDPS materials increase the stiffness of the balloon 30 and reduce elongation properties thereof. In still additional embodiments of the technology, the core 50 and/or the coating 60 can include anti-microbial or other additives to impart additional therapeutic, durability, or other properties to the balloon 30. For example, such additives can be distributed homogeneously in the coating 60, or the additives can be a constituent of another coating applied directly to the core 50 or to the coating 60. When such an additional coating is applied directly to the core 50, the coating 60 can be applied onto the other coating. In several specific examples, the additives can comprise salt or silver-based anti-microbial materials that inhibit the growth of microbes on and/or into the core 50. The multi-layered construction of first and second materials of several embodiments of the balloon may have a substantially consistent surface and retain elastic material properties, increased acid resistance, and lower permeability. For example, the first material of the core 50 can provide good elasticity enable molding processes that provide a controlled wall thickness, and the second material of the coating 60 can provide good resistance to acid, fungus, bacteria and other microbes. The second material of the coating 60 can also have a low permeability. Although the method and agent have been described in terms of what are presently considered to be the most practical and preferred embodiments, it is to be understood that the disclosure need not be limited to the disclosed embodiments. It is intended to cover various modifications and similar arrangements included within the spirit and scope of the claims, the scope of which should be accorded the broadest interpretation so as to encompass all such modifications and similar structures. The present disclosure includes any and all embodiments of the following claims. a coating of a second material on at least one of the inner surface of the core and the outer surface of the core, wherein the first material is more elastic than the second material and the second material has a lower permeability than the first material, and wherein the second material comprises polydiphenylsiloxane. 2. The intragastric balloon of claim 1, further comprising two cuffs configured to receive a shaft extended through the intragastric balloon. 3. The intragastric balloon of claim 1, wherein the first material is of a more dimensional consistency than the second material. 4. The intragastric balloon of claim 1, wherein the first material has a viscosity suitable for molding processes. 5. The intragastric balloon of claim 1, wherein the first material is primarily of polydimethylsiloxane. 6. The intragastric balloon of claim 5, wherein the second material has higher acid resistance than the first material. 7. The intragastric balloon of claim 1, wherein the second material is less permeable than the first material. 8. The intragastric balloon of claim 1, wherein the intragastric balloon has an expansion ratio of at least about 200% by diameter and at least about 500% by volume. at least a first balloon fixed to the shaft, the first balloon having a core of a first material and a coating of a second material, the second material comprising polydiphenylsiloxane, wherein the core has an inner surface and an outer surface, and the coating is on at least one of the inner surface of the core and the outer surface of the core, and wherein the first material comprises polydimethylsiloxane. "Living with the BIB: BioEnterics Intragastric Balloon Program: Patient Information"; INAMED Health: Bioenteris Corporation, ECO-SBA-10434; dated Apr. 20, 2004 and May 14, 2005, located online at: www.sydneyobesity.com.au/pdf/M946-01.pdf; 10 pages. "ReShape Inflatable Gastric Balloon Going on Trial as Weight Loss Option," MedGadget: Internet Journal of Emerging Medical Technologies. Feb. 4, 2010, 5 pages. Canadian Office Action; Application No. 2,638,163, mailed Mar. 10, 2015, 4 pages. Canadian Office Action; Application No. 2,638,988, mailed Dec. 22, 2014, 3 pages. Canadian Office Action; Application No. 2,691,530, mailed Dec. 18, 2014, 4 pages. European Examination Report; Application No. EP108002918.2, Applicant: Reshape Medical Inc., mailed Dec. 17, 2014, 5 pages. European Examination Report; Application No. EP10802994.3, Applicant: Reshape Medical Inc., mailed Dec. 18, 2014, 4 pages. European Search Report-Supplementary; EP 03726447.0, Applicant: Applied Medical Resources Corporation: Mar. 1, 2006, 3 pgs. European Supplementary Search Report; Application No. 08771842.5, Apr. 4, 2015, 3 pages. European Supplementary Search Report; EP Application No. 10802918.2, Applicant: ReShape Medical, Inc., mailed Jun. 5, 2013, 6 pgs. European Supplementary Search Report; EP Application No. 10802994.3, Applicant: ReShape Medical, Inc., mailed Jun. 28, 2013, 8 pgs. Extended European Search Report; Application EP11740536.5, Applicant: ReShape Medical, Inc. mailed Jul. 3, 2014, 8 pages. Extended European Search Report; Application EP11831683.5, Applicant: Reshape Medical, Inc., mailed Jul. 3, 2014, 8 pages. Extended European Search Report; Application No. 08732989.2, Applicant: Reshape Medical, Inc., mailed Oct. 16, 2014, 7 pages. Extended European Search Report; Application No. EP11748141.6, Applicant: Reshape Medical, Inc., mailed Feb. 25, 2014, 6 pages. Extended European Search Report; Application No. EP11766679.2, Applicant: Reshape Medical, Inc., mailed Dec. 12, 2013, 6 pages. Extended European Search Report; Application No. EP6827098.3, Applicant: Reshape Medical, Corporation, mailed on Aug. 25, 2014, 3 pages. Extended European Search Report; Application No. EP6827313.5, Applicant: ReShape Medical Corporation, mailed Jul. 30, 2014, 5 pages. Extended European Search Report; Application No. EP6827314.3, Applicant: ReShape Medical Corporation mailed Aug. 1, 2014, 3 pages. Extended European Search Report; Application No. EP6847847.8, Applicant ReShape Medical Corporation, mailed Aug. 14, 2014, 5 pages. Final Office Action; U.S. Appl. No. 13/556,032, mailed on Jan. 28, 2014, 8 pages. Final Office Action; U.S. Appl. No. 13/858,767, mailed on May 30, 2014, 12 pages. Final Office Action; U.S. Appl. No. 13/858,767, Mailing Date May 22, 2103, 12 pages. International Search Report; International Application No. PCT/US1155373, Applicant: Reshape Medical, Inc., dated: Jan. 20, 2012, 7 pages. International Search Report; International Application No. PCT/US2003/012782, Applicant: Applied Medical Resources Corporation, dated: Oct. 28, 2003, 7 pages. International Search Report; International Application No. PCT/US2006/042336, Applicant: Abdominus, Inc., dated: Mar. 14, 2007, 9 pages. International Search Report; International Application No. PCT/US2006/042710, Applicant: Abdominus, Inc. et al., dated: Mar. 15, 2007, 9 pages. International Search Report; International Application No. PCT/US2006/042711, Applicant: Abdominus, Inc. et al, dated: Mar. 16, 2007, 9 pages. International Search Report; International Application No. PCT/US2006/048647, Applicant: Abdominus, Inc. et al., dated: May 22, 2007, 12 pages. International Search Report; International Application No. PCT/US2008/058677, Applicant: ReShape Medical et al., dated: Aug. 21, 2008, 12 pages. International Search Report; International Application No. PCT/US2008/068058, Applicant: ReShape Medical, Inc. et al, dated: Nov. 19, 2008, 11 pages. International Search Report; International Application No. PCT/US2010/029865, Applicant: ReShape Medical, Inc., dated: Jan. 5, 2011, 9 pages. International Search Report; International Application No. PCT/US2011/024077; Applicant: ReShape Medical, Inc., dated: Apr. 6, 2011, 12 pages. International Search Report; International Application No. PCT/US2011/024082, Applicant: ReShape Medical, Inc., dated: Apr. 6, 2011, 10 pages. International Search Report; International Application No. PCT/US2011/026233; Applicant: ReShape Medical, Inc., Mailing Date Apr. 26, 2011, 9 pages. Japanese Office Action; Application No. 2013-43712, mailed Jan. 8, 2015, 8 pages. Japanese Office Action; Application No. 2014-52972; mailed Feb. 25, 2015, 7 pages. Non-Final Office Action; U.S. Appl. No. 11/263,302; dated: Oct. 9, 2012, 6 pages. Non-Final Office Action; U.S. Appl. No. 11/694,536; dated: Oct. 26, 2011, 13 pages. Non-Final Office Action; U.S. Appl. No. 12/625,473; dated Jul. 12, 2012; 10 pages. Non-Final Office Action; U.S. Appl. No. 12/625,473; dated Oct. 24, 2011, 18 pages. Non-Final Office Action; U.S. Appl. No. 12/723,545; dated Feb. 29, 2012, 10 pages. Non-Final Office Action; U.S. Appl. No. 12/753,751; dated Oct. 5, 2012, 8 pages. Non-Final Office Action; U.S. Appl. No. 13/074,956; dated Oct. 1, 2012, 8pages. Non-Final Office Action; U.S. Appl. No. 13/386,638, mailed on Jun. 27, 2014, 12 pages. Non-Final Office Action; U.S. Appl. No. 13/386,650; mailed on Jun. 3, 2014, 15 pages. Notice of Allowance; U.S. Appl. No. 12/753,803, dated May 13, 2014, 18 pages. Ostrovsky, ReShape Inflatable Gastric Balloon going on Trial as Weight Loss Option; http://www.medgadget.com/2010/02/reshape-inflatable-gastric-balloon-system-going-on-trial-as-weight-loss-option.html Feb. 4, 2010, retrieved on Feb. 10-13. Wahlen Ch et al. "The BioEnterics Intragastric Balloon: How to use it" Obesity Surgery 2001; 11:524-527.